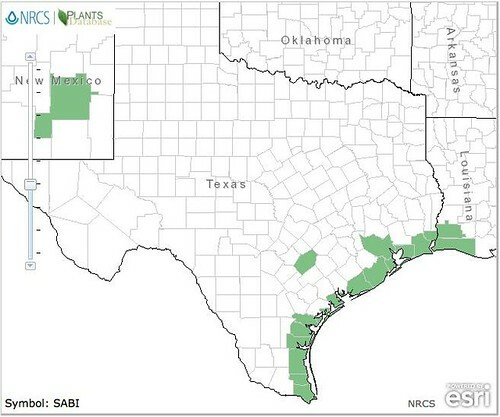 Dangers: raw seeds contain toxic saponins and should not be eaten whole. Another view. 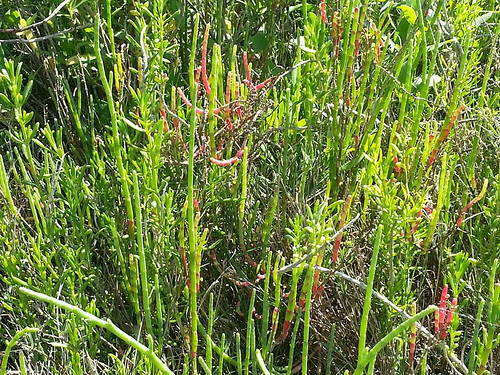 As Glasswort ages it turns reddish in color. 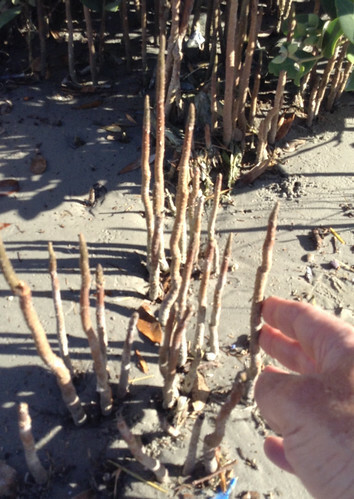 Old, dried-up glasswort looks like small stalagmites. 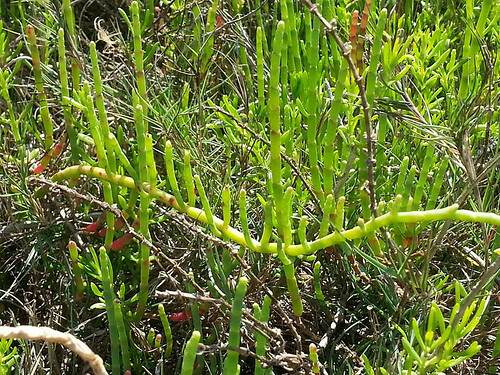 Looking like some alien lifeform, Glasswort adds an interesting appearance to coastal beaches. Some say it's name comes from the sound it makes when stepped upon as it cracks like breaking glass. However, the burned ashes of Glasswort were used as a flux in glassmaking, lowering the temperature needed to melt sand into glass so I think that's where the name came from. 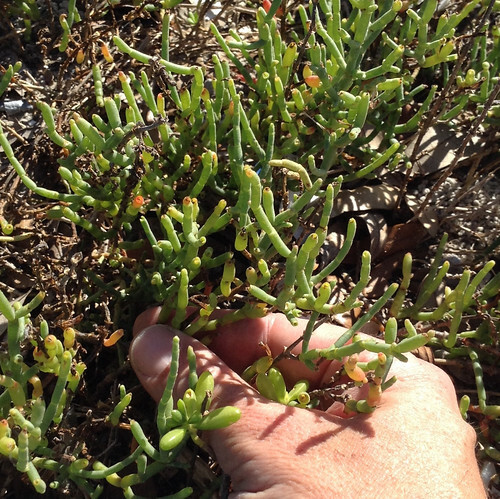 Glasswort has the amazing ability to grow even when watered with salty sea water. 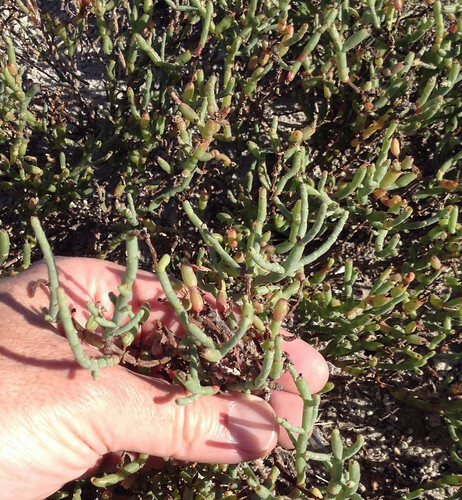 The young, tender tips of Glasswort are eaten raw in salads or even just as a snack on the beach. As the plant matures these stems turn reddish and woody. Boiling the pinkish woody stems may give you a bit of tender, edible outer sheath with a more inedible woody core. 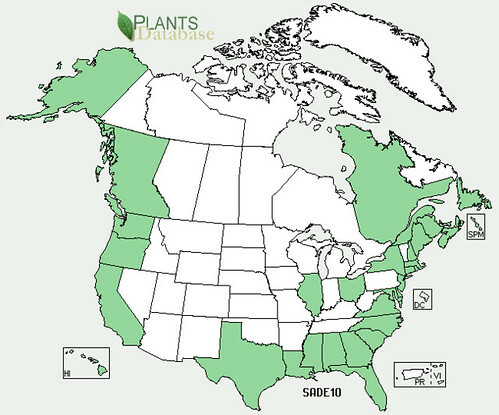 The seeds contain a coating of toxic saponins and can not be eaten raw or cooked. However, the oil pressed from these seeds is quite edible, tasty, and useful as a cooking oil. 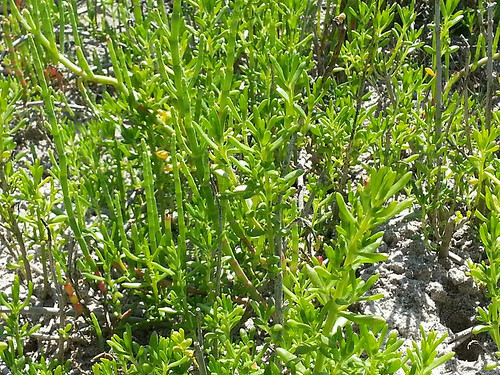 The ashes left after burning Glasswort are high in mineral content including salt and are used to flavor foods.